Interlocking and convoluted plots, young lovers rejected and scorned, manipulations and grand misunderstandings at every turn. These plot lines are perfect for a modern-day telenovela or soap opera but they were actually written almost 500 years ago by William Shakespeare, which is what makes “A Midsummer Night’s Dream” one of the Bard’s most enduring, and endearing, plays. The basic story of this fantastical play—now being performed under the stars by members of HITFest on the grounds of the Bridgehampton School—surrounds the marriage of the Duke of Athens, Theseus, and the Queen of the Amazons, Hippolyta. The plot is thickened by the adventures of four young lovers and a group of six amateur actors, all of whom are magically manipulated by fairies who live in an Athenian forest. What I like about this charming production is that it’s casual, contemporary and modern, yet it’s very clear that the actors understand Shakespeare, a task which has been proven a difficult undertaking by some of the most esteemed actors on the stage. The natural outdoor setting and simple but clever stage is absolutely perfect for this play, which is, after all, set in a forest. One small note: don’t forget to slather yourself in insect repellent so you can fully enjoy the show without having to swat at flying pests. Casto, Stephan Scheck, Michael Iannuzzi, Elizabeth Oldak, Alan Stewart, Holly Goldstein, Julie King, Irene Galaktionova and Maximilian Tabet—works well together, casting a spell on the audience as well as on each other. On Thursday night, a good crowd of approximately 100 people showed up to sit under the stars and be transported to what the program promised was a “lyrical moment, outside of time; somewhere lovely, like here.” They were held rapt during the two-plus hour drama/romantic comedy. Shakespeare truly is the font from which all stories flow. And the cast of this production, deftly directed by Joshua Perl, told it as it should be: simply, and with entertaining charm. Bottom line: Pack a picnic basket and a bottle of wine, bring a blanket and enjoy this Shakespearean story as it should be told—simply, under the stars. 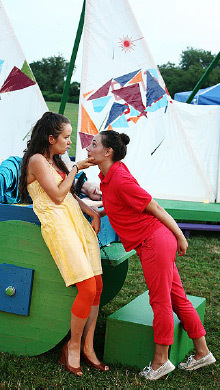 “A Midsummer Night’s Dream” will continue at the Bridgehampton School grounds Thursday, August 16, through Sunday, August 19, at 7 p.m. each night. Admission is $20. For more information, call 525-2995 or visit hitfest.org.